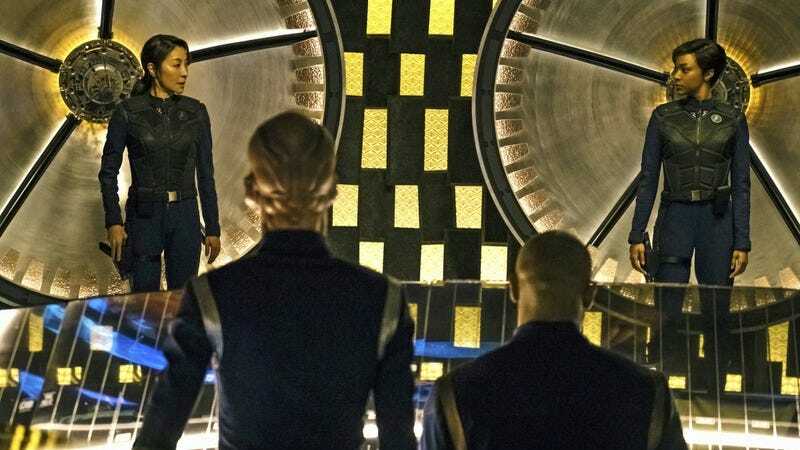 The newest addition to the Star Trek franchise, Discovery, has set a course for a September premiere, which means it’s really happening now. With the first voyage now in sight, CBS has stepped up the promotional push, releasing photos of Jason Isaacs as the rather stiff-looking captain of the Discovery, as well as info on what makes the lead character tick. As First Officer Michael Burnham, Sonequa Martin-Green will have what she calls the “Vulcan conflict,” i.e., she’ll be torn between her human ancestry and her Vulcan schooling. But that’s far from the only struggle Burnham will have, according to showrunners Aaron Harberts and Gretchen J. Berg. They tell Entertainment Weekly that, despite having her career mapped out, Burnham will have to make “a very difficult choice that sends her life on a very different path.” Although she begins the series aboard the Shenzhou, which is captained by Philippa Georgiou (Michelle Yeoh), she’ll jump ship to before long. Her change in coordinates will have wide-reaching effects, too, and will kick off what Harberts and Berg call the “second pilot” aboard the Discovery. Harberts and Berg also expanded on how having a First Officer in the lead role will affect the storytelling: “It’s a fresh feeling because we’re not on the bridge all the time. We get access to more parts of the ship.” Which isn’t to say that there won’t be plenty of time spent near the captain’s chair—the Klingons will play a big, antagonistic role in the first season, according to the showrunners.